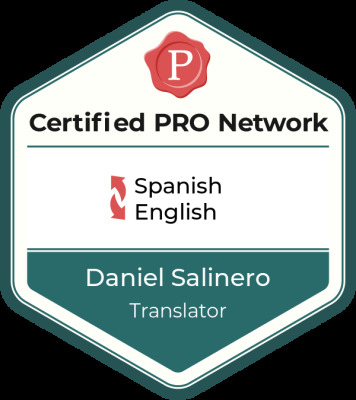 Welcome to The Write Translator, the website of Daniel Salinero. I'm a balanced bilingual (Spanish-English). I pride myself on the level of detail and special attention I apply to maintain the meaning of the source text while creating a target text tailored to a client's intended audience. I provide quality translations from Spanish↔English. My linguistic competency, in combination with my professional preparation and experience in translation and education, helps to ensure that your translations are true, accurate and correct. I am not part of an agency. When you work with The Write Translator, you work with me and I am personally responsible for every aspect of the project. Depending on the assignment, I do collaborate with editors and proofreaders from the country of the targeted audience, but you are notified beforehand and the proper permission is secured from you in order to maintain confidentiality of your assignment. From time to time, I am fortunate to be able to provide pro bono work for non-profit organizations and other political, social, and cultural organizations whose values and goals I support. Please see my Rates page for more information.